Kieran Roe, Executive Director of the Carolina Mountain Land Conservancy; Kudzai Mabunda, owner of Topic Family Care Home [photo credit: Mountain Bizworks]; and Caroline Guffey, owner of Tangles hair salon. to fund small businesses and mortgages in Western North Carolina. That is how it started. The lending that is made possible through the Go Local CD, like all of our lending, is targeted to borrowers who are traditionally underserved by lenders, such as women, minorities, rural folks, who, in this case, also live in Western North Carolina. Small businesses and the entrepreneurs who start them are the backbone of our local economy and drive the growth of jobs and innovation. These businesses have been under tremendous economic pressure with the downturn in the economy, at the same time that all lenders have had to tighten their belts and put more restrictions on their lending. One of the results has been that often these folks do not believe that financing is even available for them, so they give up before they apply. The Go Local CD can help to bring attention to the fact that Self-Help has funds available and is interested in lending to local businesses and growing our local economy. Funds from these deposits are now supporting our local small business lending, home mortgages, and even small “business purpose” loans (loans under $10,000 for a specific small business need). Often, traditional lenders have rigid criteria, such as minimum credit scores, maximum debt-to-income ratios, etc. the sum of all the parts, instead of focusing on any one aspect of a business. And one of our critical things to look at is what role will this loan play in building or strengthening overall economic development, especially among our “mission” targets. Although there is no regular system of reporting to depositors, Self-Help is happy to provide information upon request to our CD holders on loans made possible through their investment with us. We have also been fortunate in receiving a lot of local press coverage of the program. Frankly, one of the challenges has been getting our local lending boosted up to move these deposit dollars out quickly into the community. Self-Help Credit Union has a long history of lending to low- income and women-owned and minority-owned businesses, but lending requests have dropped down somewhat with the recession. like Asheville and our vibrant WNC towns. Our current CD rates are 0.25% for 3 months, 0.55% for 6 and 12 months, 0.75% for 24 months, 1.00% for 36 months, and 1.25% for 48 months. One of the great rewards of this program has been hearing from folks who are buying these certificates of deposit. They are happy to park some funds with us, at a rate comparable to many banks, while knowing the impact their investment will have in their community. I would say that it is critical to align your program with any localist organizations that might exist in your community. They are able to get the word out to the ideal target market constituents via their network. Our program would never have had the success it has had without the wonderful support of Asheville Grown. 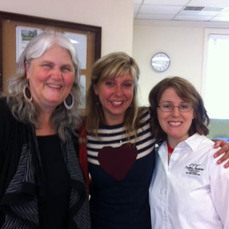 Jane Hatley, Franzi Charen of Asheville Grown, and Abigail Suarez, Marketing Assistant with Self-Help.